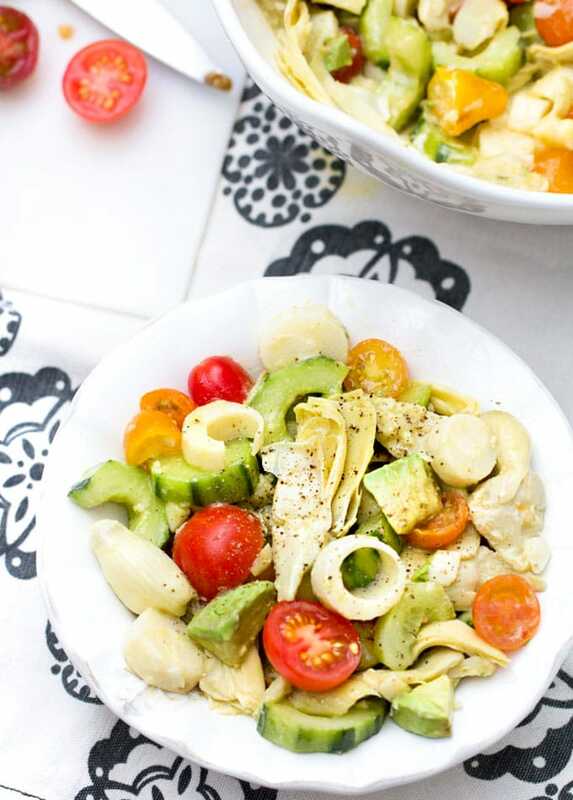 This Brazilian hearts of palm salad is packed with everyone’s favorites: artichoke hearts, cucumbers, avocados, cherry tomatoes and hearts of palm. It had an exotic gourmet quality about it and it’s SO easy to throw together. Just some slicing and dicing and whisking up the delicious lemony-mustard-garlicky dressing that brings it all together. Do you ever find yourself digging to the bottom of the salad bowl to get all the good stuff? The chunks of avocado, cucumber or tomato that have sunk down under all the lettuce leaves? This hearts of palm salad is all that good stuff, minus the lettuce leaves. 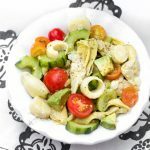 It’s a sumptuous salad of hearts of palm, artichoke hearts, cucumber moons, avocado and cherry tomatoes, bathed in a delicious mustardy vinaigrette. 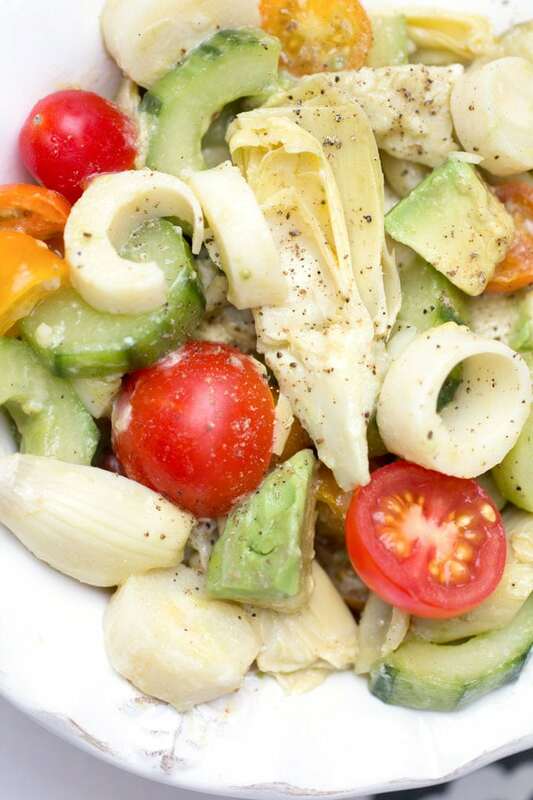 I love hearts of palm and artichoke hearts in salad. They have wonderful briny flavor and an interesting texture that’s at the same time firm and tender to the bite. They are particularly brilliant together with fresh cucumbers, juicy tomatoes and creamy avocado. 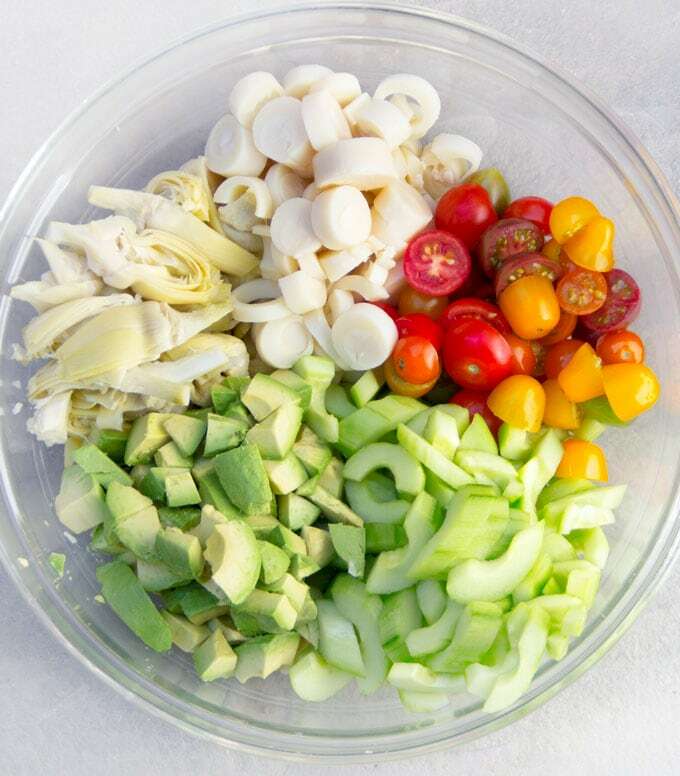 You’ll find similar chopped vegetable salads throughout Latin America, especially in Brazil, Costa Rica and Ecuador, where hearts of palm are grown. The recipe is easy, as long as you’re up for some slicing and dicing. First make the dressing. It’s a simple mix of olive oil, lemon juice, dijon mustard, garlic, salt and pepper. Set that aside. 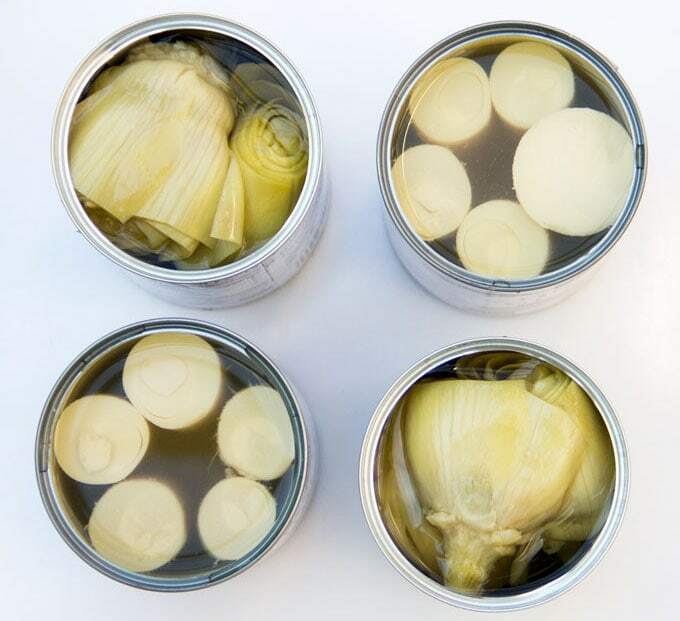 Open the cans of artichoke hearts and hearts of palm. Slice the hearts of palm into discs. Slice the artichoke hearts into quarters and remove any tough outer leaves. Peel, halve, and scrape out the seeds of two hothouse cucumbers. Slice them into moons. Open and slice the avocado and immediately toss it with dressing, to prevent it from turning brown. Halve the tomatoes and add them to the mix. Toss everything with dressing. That’s it! I’ve made variations on this theme over the years – salads with hearts of palm and artichoke hearts. But a few weeks ago I set out to come up with the ultimate version, worthy of sharing on Panning The Globe. I’m thrilled with how this salad turned out. First of all, it’s absolutely delicious, definitely special enough to serve to company. I’ve already put that to the test. And, it’s easy to make, with readily available ingredients. I cooked Spanish arroz con pollo (chicken and rice casserole) for friends recently and served this hearts of palm salad on the side. It’s a perfect accompaniment for a hearty casserole. It would also be great with a sandwich, a burger, anything on the grill, roast chicken, steak… It also makes a great lunch just on its own. I’ve put that to the test too. 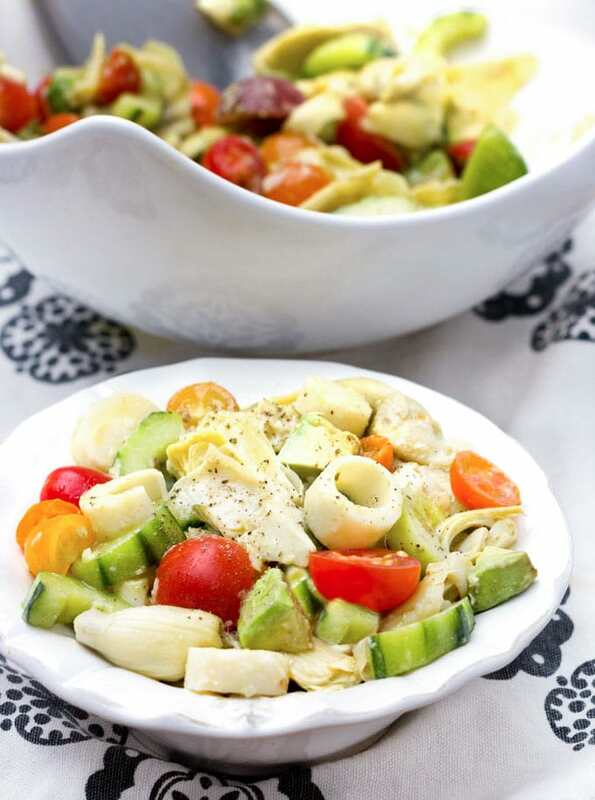 Here’s the recipe for Hearts of Palm Salad with Artichokes, Cucumber, Tomato and Avocado. This recipe makes a lot but you can easily cut it in half. I hope you try this delicious recipe. If you do, please come back to leave a comment and let me know how it turned out. 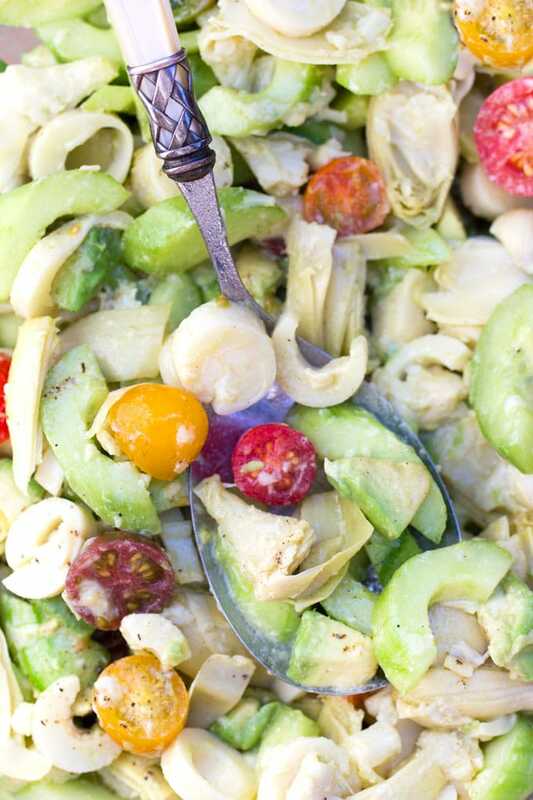 Sliced hearts of palm, artichoke hearts, cucumbers, avocados and cherry tomatoes tossed in a lemony mustard vinaigrette – a quick and easy salad that’s worthy of a special occasion. Make The Dressing: Whisk all the ingredients vigorously until they’re emulsified. Set aside. Cut the cucumbers into half moons: Peel the cucumbers. Slice them in half lengthwise. Using a small spoon, scrape out the seeds that run down the middle of each half. Then make 1/3-inch cuts crosswise, which will give you little cucumber half moons. Quarter the Artichoke Hearts: Pull off any tough leaves from the outside of the artichoke hearts. Then slice each heart into quarters, lengthwise. Cut The Avocados: Cut the avocados last, right before you toss the the salad with dressing, to make sure they don’t discolor. Cut them into bite-sized cubes or slices. If you want a nifty way to slice avocados, check out the photos in my guacamole recipe post. Toss all the ingredients together with the dressing, in a large bowl. Season, to taste, with salt and pepper. Serve cold or at room temperature. NOTE: This recipe can be easily halved. I make this salad almost every week. So delicious and healthy, yet filling. I’m so glad to hear it! Thanks so much for letting us know. Great dish! Easy to prep, and we loved the dressing. Unfortunately, we had no avocado…But it was still delicious! Would definitely use an avocado another time. Yay! That’s great to hear!! I love this! So fresh. So filling and so delicious! Sometimes I add capers and olives.